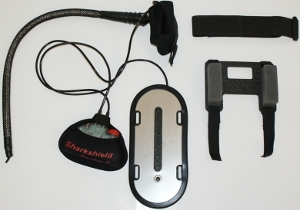 Shark Shield Pty Ltd (Shark SHIELD) is a company established in 2006 in the south of Australia. The company’s core business is developing and marketing shark repellent technologies. Used by swimmers, divers, life-savers, elite military forces and Olympic tri-athletes, the technology is a proven and yet harmless shark repelling device. Since its development, Shark SHIELD technology has caused waves of interest from the coasts of Australia to the shores of the Republic of South Africa (South Africa). Shark SHIELD technology is based on an invention made in the 1990s by the South African government through the Kwazulu Natal Sharks Board (KZN) – the tourism and research center in the south coast of the country that provides safety measures for its bathers and beaches. For over ten years, KZN experimented in the use of electrical fields to repel sharks. In 1996, the board developed and marketed a particular kind of electrical shark repellent – the Shark Protective Oceanic Device (Shark POD) – through a spin-off company called POD Holdings Ltd. Commercialized as the Shark POD Diver Unit, it had three main components linked by cables. Its main body contained a 12 volt battery pack and one stainless steel electrode attached to the diver’s oxygen cylinder. Another electrode – at the diver’s foot – was attached to the diver’s fins. Separated by almost 1.5 meters, the two electrodes created an electrical field around the diver which repels sharks by disrupting the creature’s sensory and neuromuscular system causing it to recoil from the diver’s vicinity. The device, moreover, had an activation switch with a low battery warning light over the diver’s shoulder where it was easily accessible. Shark PODs were intended to be activated immediately upon entering water during a dive and switched off when leaving it. The device successfully satisfied controlled field tests, repelling sharks (especially the predatory Great White Sharks) that came within one meter of the diver. Tests against other sharks (the Tiger shark, and the Bull shark, for example) were limited but also showed positive results. The results varied depending on the shark species with some sharks – the harmless Nurse shark, for example – showing little reaction to the device. While the technology had tremendous potential for applications, it was mostly intended for use by a limited client-base (for example, professional divers who want to repel sharks rather than view them as recreational divers do) as well as being big, heavy and expensive. For these reasons, distribution of the Shark PODs ended in 2001. Recognizing the potential inherent in the technology, an Australian diver and entrepreneur, Mr. Mike Wescombe-Down, acquired an exclusive, worldwide license agreement with KZN for further research and development (R&D) of the Shark POD device. Having lost his diving partner to a shark attack, Mr Wescombe-Down was motivated to use his diving know-how and industrial design experience to develop a modified, commercially viable version of the Shark POD. In collaboration with marine biologists, the entrepreneur carried out further R&D tests against Great White sharks both in South Australia and Jeffries Bay in South Africa. In 1999, with a view to develop the new technology further and seek new commercial opportunities for the device, Mr. Wescombe-Down co-founded Sea Change Technology Holdings (Sea Change) in Australia. In 2000, early prototypes of the new device were used to protect tri-athletes during the Summer Olympics in Sydney, Australia. Working with partners such as Gerard Corporation (an electrical goods retailer), Playford Capital (an investment corporation focusing on start-ups) and Nippon Kaiyo (a marine equipment supplier), in 2002 Sea Change launched a new device called Shark SHIELD. 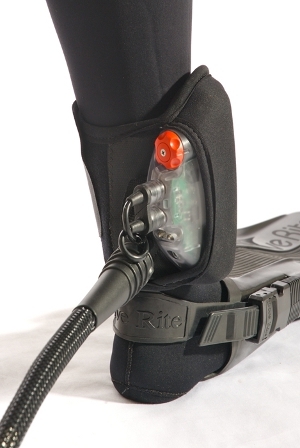 Compact in size and with straps for the recreational swimmer’s legs or occupational diver’s pouch and consisting of two electrodes, the shield generated a three dimensional, eight meter wide electrical field around the user. Complementary to the field-studies and tests, Sea Change carried out market research studies in order to establish its core customer base. Surveying the opinions of over 100 scuba-divers, the company gathered detailed information of pricing and expectation for its new device. Armed with solid consumer-research figures, the company conservatively projected its share of the market to be around 30% over the first five years. With a new product in hand and customers at the ready, Sea Change went into production for a wide range of new protective products against all predatory shark species including Great Whites, Tiger sharks, Bull sharks, Makos, and Bronze Whalers. In 2006, Sea Change adopted a new corporate name that was in line with its most well-known brand. The company subsequently became Shark Shield Pty Ltd. Within a year, the new company launched a new generation of Shark SHIELDs that were smaller (the size of a mobile phone), lighter (weighing about one pound) and with longer battery life-spans. Shark SHIELD and related brands are currently geared towards a wide market of consumers including recreational and professional swimmers, divers, surfers, snorkelers, fishermen and kayakers. Because of its growing client-base, the company continues to adapt and diversify its brand portfolio and to streamline its corporate image while meeting consumer demand. The company’s brands include: Shark Shield Surf (for surfing, kayaking, canoeing, and wave skis); Shark Shield Freedom 7 (for swimming, snorkeling, and surfing); and Shark Shield Scuba. To expose its brands to new customers and clients, the company uses various strategies including participation in international fairs such as the Pacific 2010 International Maritime Exposition in Sydney and using networks of distributors such as Nuvair (a health & safety goods supplier) in the United States of America (USA). Through constant brand development, Shark SHIELD aims to maintain its loyal customers, remain competitive, and attract new customers and clients. Having invested much time and effort on developing its invention and brands, Shark SHIELD is keen to commercialize its products while securing intellectual property rights (IPRs). 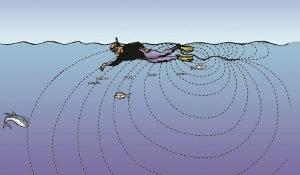 To that end, in 2002 the company filed a patent application for its shark repelling device at the Intellectual Property office of Australia (IP Australia). In order to market its products worldwide while protecting its intellectual property (IP) assets, the company filed an international patent application using the Patent Corporation Treaty (PCT) system entering into the national phase in five countries. In 2005, moreover, the company registered Shark SHIELD as a trademark via IP Australia. Desiring to further their invention, KZN ceded its patent of Shark POD technology to what was then called Shark POD Holdings Ltd, a company in which the board was a shareholder. Shark POD Holdings in turn licensed its IP to Sea Change Technologies, in order to develop a new product for divers. As Sea Change became Shark SHIELD, the invention reached a new milestone and commercialization proceeded apace. KZN, however, still maintains a close contact with its IP and the board carries out tests and approves prototypes of all new Shark SHIELD applications. Shark SHIELD is proud to promote the environmental strengths of its products. The device’s electrical wave-form repels sharks from attacking humans without long-term, adverse effects to the animal. Because the device is harmlessly effective, the company believes that sharks (such as the endangered Great White) will be preserved or spared from being culled or trapped in nets designed to keep them away from human sea-goers. The electrical field, moreover, has no known negative side-effects on other marine life (other than rays and estuarine crocodiles). Shark SHIELD products, furthermore, are sold in recycled packaging in line with the company’s ethical stance on environmental conservation. More than 17,000 Shark SHIELD personal units are already providing life-saving protection to ocean-goers in Australia. The devices are used in many recreational and professional marine activities including swimming, snorkeling, scuba diving, and fishing or mounted on the boards of surfers. The technology is approved by the Australian military, the South African navy, the USA Coast Guard and members of the North Atlantic Treaty Organization (NATO). Other country’s militaries (Japan, for example) also use the device. Having stalled in their plan to market their technology, KZN board members quickly licensed it to an enthusiastic champion, an entrepreneur with a clear vision for the product. With other partners including those in government and industry, Mr. Wescombe-Down used a pro-active R&D strategy and eventually marketed a product protected with IP that is saving the lives of humans and sparing those of sharks. Sea-goers around the world are currently catching waves in safety and sharks are swimming freely in a surfers’ paradise and sharks’ haven.